COSMIC is an online database of somatically acquired mutations found in human cancer. Somatic mutations are those that occur in non-germline cells that are not inherited by children. COSMIC, an acronym of Catalogue Of Somatic Mutations In Cancer, curates data from papers in the scientific literature and large scale experimental screens from the Cancer Genome Project at the Sanger Institute. The database is freely available without restriction via its website. The COSMIC database was designed to collect and display information on somatic mutations in cancer. It was launched in 2004, with data from just four genes, HRAS, KRAS2, NRAS and BRAF. These four genes are known to be somatically mutated in cancer. Since its creation, the database has expanded rapidly. By 2005 COSMIC contained 529 genes screened from 115,327 tumours, describing 20,981 mutations. By August 2009 it contained information from 1.5 million experiments performed, encompassing 13,423 genes in almost 370,000 tumours and describing over 90,000 mutations. COSMIC version 48, released in July 2010, incorporates mutation data from p53 in collaboration with the International Agency for Research on Cancer. In addition, it provided updated gene co-ordinates for the most recent human reference genome builds. This release includes data from over 2.76 million experiments on over half a million tumours. The number of mutations documented in this release totals 141,212. The website is focused on presenting complex phenotype-specific mutation data in a graphical manner. Data is taken from selected genes, initially in the Cancer Gene Census, as well as literature search from PubMed. Data can be accessed via selection of a gene or cancer tissue type (phenotype), either using browse by features or the search box. Results show summary information with mutation counts and frequencies. The gene summary page provides a mutation spectrum map and external resources; the phenotype (tissue) summary page provides lists of mutated genes. 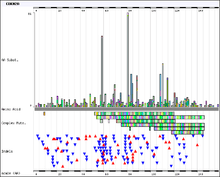 A histogram showing the mutation range for the CDKN2A gene as produced by the COSMIC database. The figure shows the CDKN2A gene, which is a tumor suppressor that leads to cancer when it is inactivated. The COSMIC database contains thousands of somatic mutations that are implicated in the development of cancer. The database collects information from two major sources. Firstly, mutations in known cancer genes are collected from the literature. The list of genes that undergo manual curation are identified by their presence in the Cancer Gene Census. Secondly, data for inclusion in the database is collected from whole genome resequencing studies of cancer samples undertaken by the Cancer Genome Project. For example, Campbell and colleagues used next generation sequencing to examine samples from two individuals with lung cancer which led to the identification of 103 somatic DNA rearrangements. ↑ Forbes, Simon A; Bindal Nidhi; Bamford Sally; Cole Charlotte; Kok Chai Yin; Beare David; Jia Mingming; Shepherd Rebecca; Leung Kenric; Menzies Andrew; Teague Jon W; Campbell Peter J; Stratton Michael R; Futreal P Andrew (Jan 2011). "COSMIC: mining complete cancer genomes in the Catalogue of Somatic Mutations in Cancer". Nucleic Acids Res. England. 39 (Database issue): D945–50. doi:10.1093/nar/gkq929. PMC 3013785 . PMID 20952405. ↑ "The COSMIC homepage". Retrieved 11 June 2012. ↑ Forbes SA, Bhamra G, Bamford S, Dawson E, Kok C, Clements J, Menzies A, Teague JW, Futreal PA, Stratton MR (2008). "The Catalogue of Somatic Mutations in Cancer (COSMIC).". Curr Protoc Hum Genet. Chapter 10: Unit 10.11. doi:10.1002/0471142905.hg1011s57. PMC 2705836 . PMID 18428421. ↑ Forbes S, Clements J, Dawson E, Bamford S, Webb T, Dogan A, Flanagan A, Teague J, Wooster R, Futreal PA, Stratton MR (2006). "COSMIC 2005.". Br J Cancer. 94 (2): 318–22. doi:10.1038/sj.bjc.6602928. PMC 2361125 . PMID 16421597. ↑ Bamford S, Dawson E, Forbes S, et al. (July 2004). "The COSMIC (Catalogue of Somatic Mutations in Cancer) database and website". Br. J. Cancer. 91 (2): 355–8. doi:10.1038/sj.bjc.6601894. PMC 2409828 . PMID 15188009. ↑ Hu, Hai; et al. (2008). Biomedical informatics in translational research. Artech House. ISBN 1-59693-038-1. 1 2 3 Forbes SA, Tang G, Bindal N, et al. (January 2010). "COSMIC (the Catalogue of Somatic Mutations in Cancer): a resource to investigate acquired mutations in human cancer". Nucleic Acids Res. 38 (Database issue): D652–7. doi:10.1093/nar/gkp995. PMC 2808858 . PMID 19906727. 1 2 3 "COSMIC v48 Release". Catalogue Of Somatic Mutations In Cancer. Wellcome Trust Sanger Institute. 27 July 2010. Retrieved 1 September 2010. ↑ "Cancer Gene Census". Retrieved 31 August 2010. ↑ Futreal PA, Coin L, Marshall M, et al. 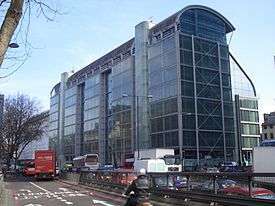 (March 2004). "A census of human cancer genes". Nat. Rev. Cancer. 4 (3): 177–83. doi:10.1038/nrc1299. PMC 2665285 . PMID 14993899. ↑ Campbell PJ, Stephens PJ, Pleasance ED, et al. (June 2008). "Identification of somatically acquired rearrangements in cancer using genome-wide massively parallel paired-end sequencing". Nat. Genet. 40 (6): 722–9. doi:10.1038/ng.128. PMC 2705838 . PMID 18438408.